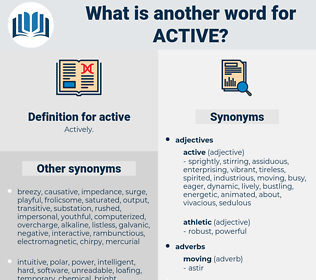 What is another word for active? in the process of doing something. active-active, productive, intense, acting, enterprising, action-oriented, actionable, bustling, potent, committed, brisk, drastic, robust, dedicated, engaged, meaningful, buoyant, significant, positive, prominent, responsive, impressive, forceful, diligent, dynamical, decisive, ardent, passive, Participative, ineffective, still-serving, extensive, assets, influential, strenuous. stakeholders, VIVAS, reagents, Medicines, drivers, employees, Les, positive, activity, Activities, activa, activates, assets. energetic, active-duty, lively, intensive, enthusiastic, involved, reactive, working-age, evolutionary, operative, radioactive, instrumental, strong, vigorous, Activities. extinct, dormant, inactive, passive, quiet. indifferent, immobile, quiescent, unworking, unmovable, inert, abeyant, lazy, disinterested, fixed, sluggish, idle, inoperative. ignorant, irresolute, dull, stupid, dispirited, slow, afraid, lifeless, calm, meek, lethargic, unenthusiastic, uneducated, weak, cowardly. arrested, vapid, ineffective, off, boring, nonoperating, inanimate, kaput, apathetic, heavy, leaden, decommissioned, deactivated, unproductive, impassive, tedious, nonproductive, nonexistent, broken, phlegmatic, nonfunctioning, unambitious, uninvolved, ineffectual, nonfunctional, useless, nonoperative. I mean to take an active part in life - to step forward - to look higher. Whatever it is, I am sure he will have a hand in it, although I don't expect he will take an active part. acquisitive, acetify, acidify, act up, agitative, accusative, associative, assistive. person, individual, someone, somebody, soul, mortal.